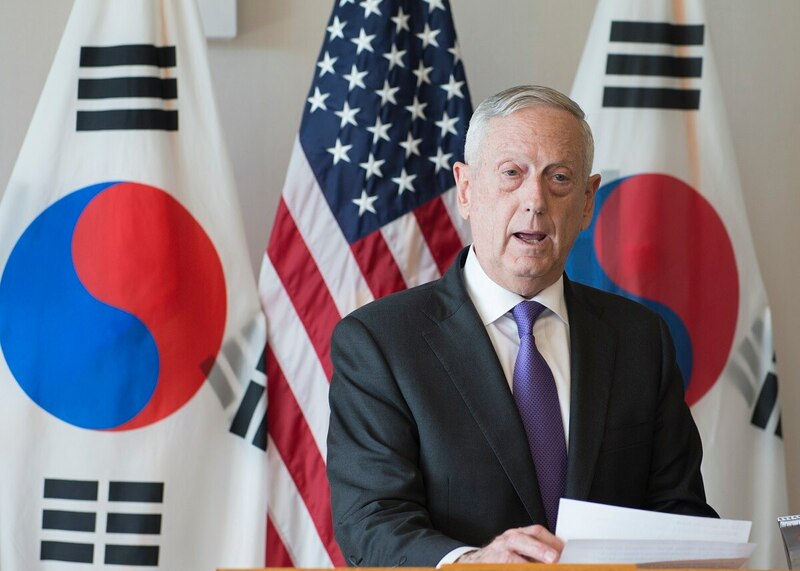 ROME – While the Olympics provides a backdrop for the highest level communications between North and South Korea in years, U.S. Secretary of Defense Jim Mattis is warning not to overestimate what may be said. Asked if he thought the discussions between South Korean president Moon Jae-In and Kim Yo Jong, the younger sister of North Korean leader Kim Jong Un, were a good early sign about tensions easing, Mattis reiterated that it was “too early” to make any calls — but pointed to North Korea’s most recent military parade as perhaps a more realistic sign of where things stand. “In the midst of all this, [Kim] ran a military parade that highlighted his ballistic missiles. That’s a very strange time if, in fact, he is trying to feel warming to the country that he has attacked repeatedly as an American puppet,” Mattis said. “So, it’s too early to tell. Some Korea watchers believe that North Korea is attempting to take advantage of the Olympics — and the desire by Moon to have the games go off without a hitch — to drive a wedge between Seoul and Washington. Splitting South Korea away from U.S. influence has been a longstanding goal of the Kim regime. Analysts have been alarmed by how Moon appears to be dealing directly with the younger Kim, leaving the U.S. as a bystander instead of an active participant in those discussions. That tension between the U.S. stance and that of Moon’s government appeared to be underlined after U.S. Vice President Mike Pence refused to stand during a joint North-South Korean entrance at the Olympic opening ceremonies and then called for increased sanctions on North Korea, at the same time Moon was presented with an offer to visit Pyongyang. Pence later denied there was any split with Korea’s government, something Mattis echoed in his comments Sunday. “There is no wedge there… on a political level in Seoul, there is no wedge that can be driven between us by North Korea,” Mattis said.